The following is the essential information you'll need to get your rig interface connected, up and running with AC Log and my contesting software. To get started with rig interface, you'll need the necessary interface hardware to connect your rig to your PC. You'll find a variety of W1GEE interfaces that support most of the common rigs here! 1. For Select Rig, select the rig you are interfacing. For most rigs, simply selecting the correct rig will also accurately set your baud rate, parity, data bits, stop bits and polling string! Icom Users Only! If you select Icom, you will also see text appear, asking you to change the rig ID (64 by default, which happens to be for the 756 Pro II) to the ID for your rig (the red lines in the graphic above). You should be able to find your rig ID in your manual's CAT control section. If there is a small h, such as 64h, ignore it and just enter the two digit number. I've also included all the successful settings I've received from other users below, which include the rig ID. 2. For Com Port, select the com port that you have your rig connected to. Even if only one port is listed, you still have to click on the port to select it. 3. For Connection Power, select the power option, if any, that your interface requires. Most use RTS, some use DTR and some do not require a power option at all. 4. Click Test to begin polling your rig. If both frequency and mode appear, you are all set! The software will follow your frequency, (and band provided you are in the limits of an Amateur band) and mode. 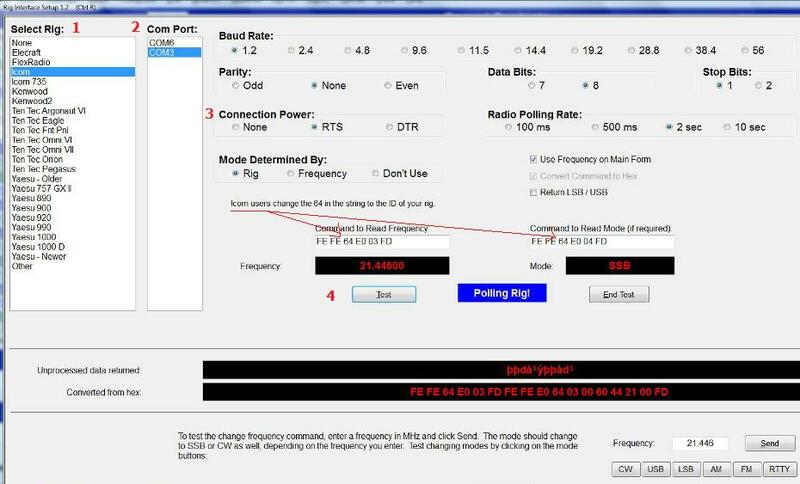 In addition, when you click on a DX spot from the main form, your rig will tune right to that frequency! In Case of Difficulty - Don't Panic! First, make sure that your rig is on and that your rig interface hardware is properly connected to BOTH your radio AND your PC. Make sure that you have selected the correct Com Port. Make sure you have selected the correct Connection Power for your interface. In some cases, certain rigs use settings other than the defaults. Take a look at all the following successful settings sent in by other users below and correct your settings as necessary. The following are working, successful settings that other users were kind enough to send along. Note that the Com Port and power option will depend on your PC and interface, so those two settings may be different than the settings listed below. If you try these settings for your rig without success, something rig or interface hardware specific is likely at play. Since I only have a Kenwood TS 440s and an Icom 756 Pro II here with W1GEE interfaces, I will not be able to provide further assistance for any other rig or interface. If you are unable to get your rig going after trying the settings below, please feel free to search the message archives on the Users group or post a question there. It's likely that someone with a similar rig and interface will be able to help. If you have settings for a rig not listed below, I would be very grateful if you would send them along, by clicking the Copy Data to Clipboard button while polling your rig and pasting the contents into an e-mail! Note, no other settings are required with the Flex API option. With this option, my software will track the active slice. Note - Icom 735 users report it is particularly important that you use the 9600 baud rate with this radio. You may have to adjust the radio's baud rate by manually removing the cover and changing a jumper in the 735. Rob, KD9INB reports: "Had to turn the connection power to "Off" in the software setting AND also in the rig, and also had to set the CI-V port in the rig from"Unlinked" to "Linked". Made sure the baud rate setting in the rig and software matched and viola! Works like a charm now." David, WB4OZM notes: When one wants to use the USB cable instead of the 3.5mm plug in the remote outlet, I need the CV-V USB Echo Back in the "ON" position. After that all works very well! Note - Kenwood rigs have two options and most will work with either selection, though I recommend Kenwood2. The settings listed below are the ones users just happened to send in. The first setting, Kenwood, always reads the VFO specified (FA; reads VFO A and FB; reads VFO B). Kenwood2 always reads the active VFO. Kenwood2 also sometimes returns a mode when the first setting does not. Please note that for the Kenwoood 590, users have reported it is necessary to change the rig's default baud rate as one user detailed here on the Users group. In short, he writes "I now set everything to 38.4 – the 2 menu settings that I didn’t know existed (61 and 62) as well as the device manager for the bridge and the software, and waalaa! It works like advertised!" That said, another 590 user reported that his 590 worked fine at 9600 baud. Also, you can enter any baud rate you like by clicking the Other button. Note - Some, but not all Yaesu 847 users were having trouble interfacing with the new, C#.NET versions of my software. This problem has been corrected in rig interface verion 1.3 and later by sending a command to start cat control when the port is opened if Yaesu - Older is selected. Your 847 must first be turned on before starting rig interface with the software.